I know you can’t judge a book by its cover, but Od Magic is one of those books I was immediately drawn to solely based on its whimsical cover art of bright pastels and its equally playful blurb. Brenden Vetch has a gift. With an innate sense he cannot explain to himself or describe to others, he is able to connect to the agricultural world, nurturing gardens to flourish and instinctively knowing the healing properties each plant and herb has to offer. But Brenden’s gift isolates him from people and from becoming part of a community – until the day he receives a personal invitation from the Wizard Od. She needs a gardener for her school in the great city of Kelior, where every potential wizard must be trained to serve the Kingdom of Numis. For decades the rulers of Numis have controlled the school, believing they can contain the power within it, and have punished any wizard who dares defy the law. But unknown to the reigning monarchy is the power possessed by the school’s new gardener, a power that even Brenden isn’t fully aware of, and which is the true reason Od recruited him. Od Magic shines brightest when it delivers on the promises of that introduction. Unfortunately, it’s also bogged down by lukewarm political intrigue and half-baked supporting characters. Brenden Vetch has learned much from his plants. He’s even found a cure for the plague that swept through his village. Unfortunately, his discovery came too late to save his parents from the epidemic, and he has lived a lonely life in his childhood home with their ghosts ever since, refusing to leave even when his brother departs to seek brighter fortune elsewhere. Only when the giantess wizard Od invites him to tend the magical plants of her school in the royal city of Kelior does he pull up roots. Brenden’s story is emotionally potent, but sadly McKillip fails to capitalize on the possibilities for character development which it presents. Vetch’s grieving process is barely mentioned, and he develops very few meaningful relationships in Od’s school. The cover summary is misleading in that it suggests that Brenden serves as the focal point of the novel. While he is indeed a pivotal character, the book’s focus widens to introduce other magical inhabitants of the city of Kelior. Contrary to the rigid belief of King Galen, Od’s school does not hold a monopoly on magic in the kingdom of Numis. Travelers from neighboring kingdoms, from commoners to nobles, have brought their own strains of magic into the land. Much of Od Magic deals with the resistence on the part of the king and on the part of Od’s school towards embracing these diverse magical traditions. In this sense, McKillip’s work provides an interesting anthropological examination of the exchange of cultural ideas, patriotism, and xenophobia. Though part of Od Magic is set in a wizard school, the novel should not be seen as a Harry Potter or A Wizard of Earthsea imitator. The students remain at the periphery of the tale. There’s only one teaching scene reminiscent of the “student wizard” genre. In fact, only one, a brilliantly talented boy named Elver, appears regularly, and he’s an atypical sampling of the student body. The novel’s stand-out performances are both suggested by its title. The giantess Od appears infrequently, as she takes a hands-off approach to running her school, preferring instead to roam the world offering aid to wounded beasts. Her enigmatic appearance and demeanor–she’s depicted with birds nesting in her hair and animals burrowing into her clothing–and her lyrical, poetic mode of speech elevate the few scenes in which she appears into high art. The magic itself as it manifests in the novel is similarly strange and delightful. Though characters allude to the dark potential of magical power, the magic in the book is playful, whimsical, and, yes, odd. In this sense, Od Magic presents a nice respite from the dark, gritty, and violent magic that populates many postmodern fantasy novels. Gabrielle de Cuir’s narration of Od Magic captures the playful essence of the novel’s best passages. Her performance of Od’s dialogue chimes in the ears like a tinkling stream, and she carries the emotions and idiosyncracies of the other female characters comfortably as well. A male narrator might have better embodied the persona of Brenden Vetch, but since the magical gardener appears all too seldomly in the novel this is not a serious shortcoming. As I said, the inviting cover image and tantalizing publisher’s summary really made me want to like Od Magic. I certainly enjoyed elements of it very much, enough to make me want to seek out some of Patricia A. McKillip’s other works. Overall, though, the novel’s lack of focus and cohesion leads me to endorse it only half-heartedly. It doesn’t sound very focused at all, although I’m drawn to read about the Wizard Od. She sounds wonderful — just what I’ve been thinking about recently. 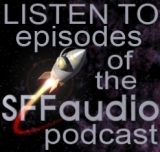 The Science Fiction Book Review Podcast – LIVE!